Manager Jim McIntyre attributes Liam Boyce's newly improved displays to the striker slimming down. 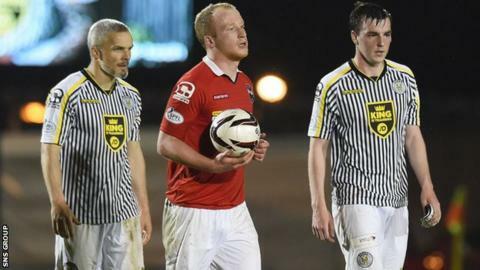 The 24-year-old Irishman scored a hat-trick in the 3-0 win at St Mirren that lifts the Staggies six points clear of the relegation play-off place. "He's come from part-time football and he had a lot of weight to shift," McIntyre told BBC Scotland. "He's worked really hard to get himself in peak condition. We always knew he could score goals." Former Cliftonville player Boyce opened the scoring on 30 minutes, reacting quickest to a loose ball after a Craig Curran shot had been saved. With bottom-of-the-table Buddies down to 10 men early in the second half after Viktor Genev's red card, Boyce then showed great skill to tee up his second, controlling on his chest before sticking the ball through the legs of a defender. And a first hat-trick for a County player in the top flight was completed with a firm stoppage-time finish. "He's been an integral part of the run and that's four goals in the last two games, which is fantastic," said McIntyre. County are now unbeaten in nine games, with this their eighth victory in a remarkable sequence that has taken them from last place to one point away from eighth place. The Dingwall side can no longer finish bottom, but McIntyre is still wary of the play-offs. "Six points isn't enough, that can quickly change," he said. "We were six points adrift before we started this run. "Teams are capable of winning five on the bounce, we've shown that, and we need to be mindful of that. "We need to keep our feet on the floor and keep trying to put in performances like we've done. "Motherwell and Partick Thistle have had good results and teams aren't just going to hand you safety - you have to go and earn it. "We have five huge games coming up." Man-of-the-match Boyce echoed his manager's thoughts as he conducted a post-match interview with the ball tucked under his arm. "We need to keep going and get more points in the table," he told BBC Scotland. "It's taken time for the manager's plans and ideas to get through and for the players to gel. "We seem to be much fitter now. We're running over the top of teams and pressurising the life out of them."